Gather & See understands that, and the store allows its customers to shop by their priority. 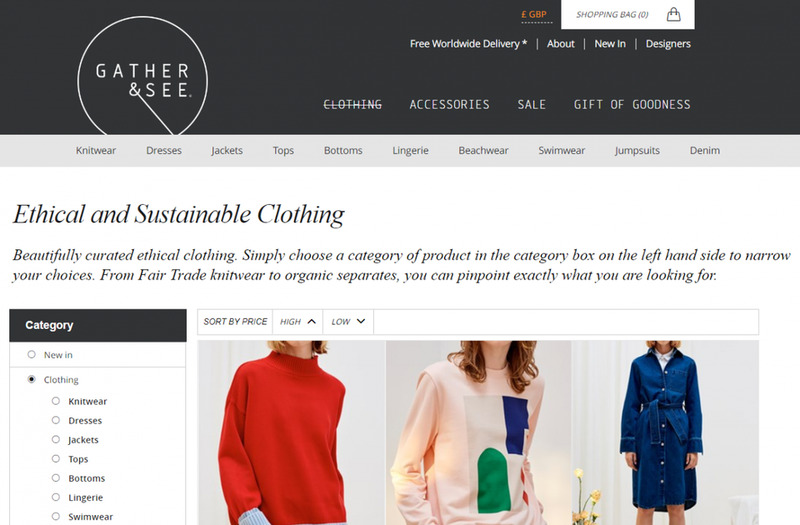 Not only can people filter its products by type or designer, but they can also select them by choosing one of the retailer’s five founding philosophies: fair trade, organic, eco-friendly, small scale production and heritage. The shop stocks clothing, accessories and jewelry that fits every budget, from affordable fashion to luxury, targeting the fashion-savvy, ethically-minded customer. Gather & See is a relatively new retailer, founded four years ago by two fashionable women who were fed up of feeling disconnected from the production process. Now, they ensure each of the more than 40 designers featured on their site produces clothing that fits into at least two of Gather & See’s philosophies. For them, it’s just as much about the ethics as the aesthetics. Founded 27 years ago, People Tree is one of the most well-established ethical retailers around. The shop’s mission is simple: to be 100% fair trade throughout their supply chain. But what does “fair trade” mean? It’s a way of doing business that guarantees workers aren’t discriminated against. They are provided with good working conditions, their rights are protected, and they are paid sustainable prices for their products. 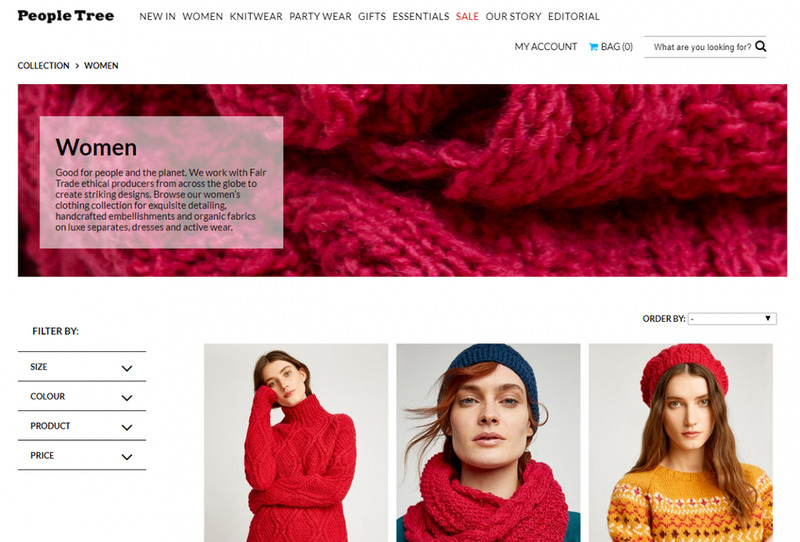 That means People Tree’s wide range of women’s fashion, that offers everything from cozy knitted jumpers to party dresses, is created by workers in the developing world who are treated well and not exploited. Not only does People Tree strive for its stock to be ethically-sourced, but it’s also aware of the environmental impact of fashion. You can trust that its clothing is all made with organic cotton and other sustainable materials, and colored using safe dyes. Even better, as many of its products as possible are shipped by sea, in order to reduce the retailers’ contribution to global warming. To say that the entertainment industry has gotten reboot- and sequel-crazy in the last few years is a comical understatement. Sabrina, The Teenage Witch is haunting our screens again, and Tyra Banks is coming out of her box in less than a week in the premiere of Life-Size 2. Mean Girls received a much-maligned sequel treatment eight years ago (and a polarizing Broadway musical just this year), so fans of the original movie have every right to feel protective against any new adaptations. Following the hype surrounding the franchise that the Broadway production aroused earlier this year, fans are once again returning to North Shore High School—and learning more about Regina George’s brunette foil: a cheerleader named Ariana Grande. In a trailer released for her upcoming “thank u, next” video, Grande actually never once makes an appearance. Instead, the trailer is a reimagining of Mean Girls‘s beloved “How do I begin to explain Regina George?” sequence, featuring characters old and new making Grande’s mysterious character that much more interesting. Fans of the movie will instantly recognize Jonathan Bennett reprising his role as Aaron Samuels (still with his hair sexily pushed back), as well as Stephanie Drummond—this time as someone breaks off her engagement after Ariana did the same thing, and not someone who overjoyed in being punched by Regina George. A few other North Shore students—played by welcome guest stars like singer Troye Sivan and YouTube personality Colleen Ballinger—recount their own rumors they’ve heard about the regal Grande: that her snoring played backwards sounds like Fantasia, that people punch themselves because she said so, and that she’s dating a girl named “Aubrey” (a nod to the song’s often-misheard lyric “Her name is Ari”). It’s an endearing tribute to a treasured movie, and is reportedly only one of the cherished female-led comedies that the video will pay homage to. Grande has yet to announce when the visual will be released, but could arrive before the week is out. One thing’s for sure: when the inevitable Legally Blonde reboot eventually comes around, the casting director should consider her their first choice for Jennifer Coolidge’s iconic role.